There’s no getting away from it, people naturally make judgements based on first impressions. This influences many decisions; from who we to talk to at an event, to selecting food from the supermarket shelf. It’s for this reason that appearances are important. When it comes to our homes, our choice of front door can speak volumes. According to a recent survey carried out by Dulux Weathershield, the colour of our front door reveals an insight into the home owners. Those questioned made judgements about resident’s characters based on front door colour. Black suggested mystery, grey sincerity and white peace, whilst those with a yellow front door were thought of as upbeat and welcoming. The colour trends for 2017 have included Black, White, Steel Blue and Pine Green. There has also been a resurgence of interest in contemporary wooden doors. With a range of grains and colours, the combination of natural wood and metallic fittings delivers a classic, expensive looking finish, which is highly desirable for modern properties. 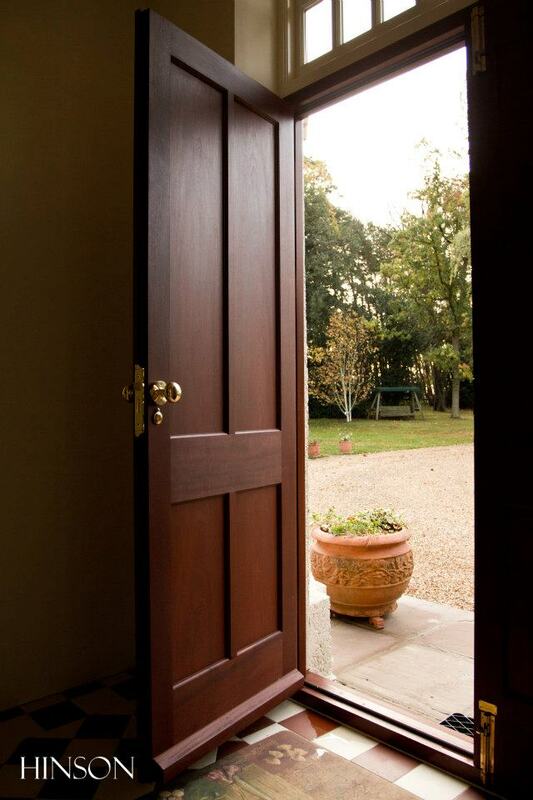 HINSON has custom made wooden front doors for period properties and modern builds. In both cases the required dimensions and style simply isn’t available as an off-the-shelf product. We work to exact measurements and designs, to craft a bespoke wooden door that offers a stylish and long lasting finishing touch. Our contemporary wooden doors have certainly enhanced the kerb appeal of these properties. Whilst we love exposing the natural wood grain, we also offer a range of finishes for our front doors, so you can have the colour you desire. If you are looking beyond the front door, it can be useful to consider the front exterior as the face of your home. People see symmetrical and well-proportioned faces as beautiful and the same applies to a property. The style of your home may not be symmetrical, but there are ways to increase the sense of harmony. As an example, placing wall lighting or plants on either side of your contemporary wooden door gives a balanced appearance. Keeping gates, walls, paths and even guttering in good condition all help to enhance the look, as does a well-maintained garden or border. Science has shown that our perception of beauty is based on more than just looks. In the case of a house, a desirable exterior suggests owners that take pride in their home. It is welcoming because it looks stylish, clean and modern. You are simply drawn inside. Older PostRetaining Original Features in Architectural Design.